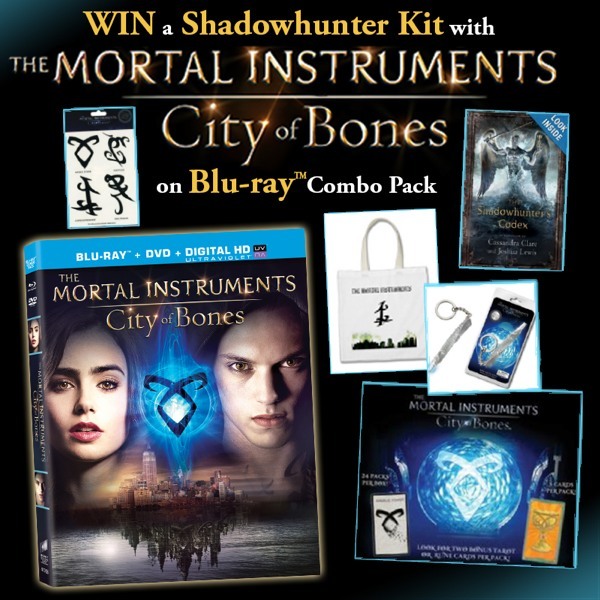 Happy Blu-Ray/DVD release to The Mortal Instruments: City of Bones in the U.S. To celebrate the release, Sony Pictures has given us five Mortal Instruments fan tote kits to give away to five lucky fans. This is open to U.S. residents only because it is a giveaway from Sony Pictures (a U.S. distributor). Limit one entry per person. Giveaway ends Friday at 11:59 p.m. EST. the Stele key ring is probably my favorite thing in this prize pack, cause I know for sure if I dont win I’ll buy the movie but very rarely do I get to get the little things.. Thanks for the opportunity, good luck to everyone and congrats in advance to the lucky winners. The stele king ring is available at toysrus for around $10. Here’s hoping I win the stele ring, the T-shirt, or the Tarot cards (as I’ve bought everything else already). LOL. This makes me wonder what the CoA merchandise might look like. What would you guys want? Personally, I LOVE the TMI merchandise, as a lot of it’s practical stuff I’ll actually use. Plus, none of the images are placed awkwardly like they are on some merch. Still… I can’t help but wish there was even MORE awesome TMI stuff=) So, yeah. What would you guys like to see? Personally, I’d love a keychain of Valentine’s ship in CoA when they do that film, but I doubt it’ll happen. LOL. Also… I know this probably isn’t the place for this, but I have even MORE respect for the movie and filmmakers now, after having watched the bonus features. They have an in-depth information center on the DVD, that fills in a lot that was missing in the movies, for one thing (which is pretty amazing and thoughtful). And I adored the extended scene with Simon and Clary! They even put the rat reference in there! Y’know… though I understand why these things weren’t in the movie, it’s kind of too bad they weren’t, since I think people would have complained less if they had been. I also really enjoyed the extended scene with Jace and Valentine that sort of expanded on their relationship more, like a lot of fans had wanted to see in the film. And do I need to even Luke’s story scene on the DVD? ASDFGHJKL. So many Luke/Jocelyn feels that scene gave me. So many! I really hope I win. Not to be greedy but I don’t have any of these things it took me forever to just get the books! But I’m obsessed with this stuff! I have a whole book of runes that I’ve drawn!! And I saw the movie in theatre and made sure a whole bunch of my friends went to. I’m praying!! !